The 20-year-old produced some superb kicks as the Tigers forced an incredible seven goal-line drop-outs against Wigan, but he admitted the kicking does not come natural to him. The improvement in this area in his game is down to hours of practice on the training field with the Tigers’ coaching staff, particularly Ryan Sheridan. Trueman explained: “I’m probably not the most natural kicker and I’ve had to do some extras to work on it. “Last year playing on the right I practised all my kicking on the right and it changed in pre-season to the left. It was tough and I struggled a lot in pre-season with my kicking. “In training a lot of my kicks were going out on the full so it’s been a lot of work to get it right. “Normally if you are left footed you prefer kicking on the left, but I’m the other way because of the way I kick when I swing my boot round. Trueman is enjoying the extra responsibility put on his shoulders this year by injuries to all the Tigers’ other more experienced half-backs then the absence of Paul McShane last week due to suspension. He said: “It’s obviously disappointing for us to get the injuries, but it’s helped me develop a lot. I’ve had to step up and be more dominant on the field. “It’s something you probably don’t get as a 20-year-old. If you are playing you have a half-back at the side of you who’s the dominant one and you can just play off the back of them. But at the minute I’ve got to step into that role and it’s helped me a lot. “Macca’s stepped into Galey’s shoes so to lose him meant we lost our main organiser (for the Wigan game) and I had to step up again and try and do it. 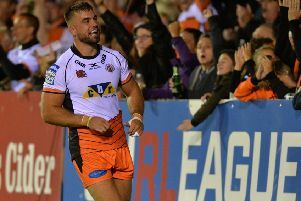 Head coach Daryl Powell has spoken in the past about looking to make his young half-back more vocal in matches and Trueman believes he is getting better in this area. He added: “I still don’t think it’s where I want to be if I want to be a top level half-back who dominates games and more often than not decides the result.